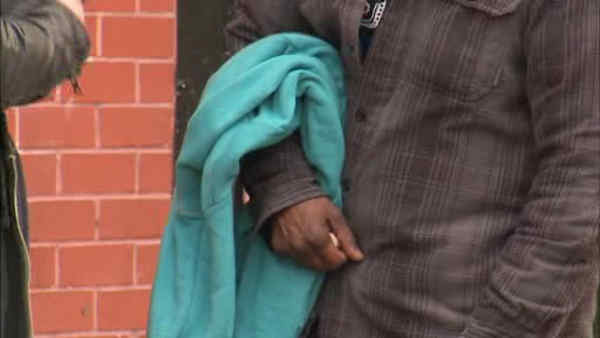 NEW YORK (WABC) -- There are currently about 60,000 people who use homeless shelters in New York City, and one of the most popular items requested are hoodies. Now, one musician is collecting them as payment when he performs to pass along and help others. Tavis Eaton is a native New Yorker with a sensitivity to the homeless. "I had a homeless gentleman that lived two doors down from my front door, and he was there every morning," he said. "I would see him sleeping on the sidewalk, and he used to sleep right next to a sewer cap in the wintertime because the steam would billow out and keep him warm." Now, years later, the 38-year-old former Marine is doing what he can to keep the homeless warm with something he calls Hoodies for the Homeless. "Hoodies and socks are the number one requested item all year round," he said. "Even in July, hoodies are what they want." Eaton acquires the hoodies in a pretty creative way. When his band Push Method performs, he has audience members to bring a hoodie, often in lieu of paying a cover. "People bring five to 10 hoodies at a time, you know, it's a great way to clean out your closet," he said. "People are bringing hoodies, and then when we contact organizations to work with and distribute them, they welcome us in with open arms." And that includes the Bowery Mission. "What we do here at the mission is great work," the mission's James Macklin said. "But we can't do it alone, and to see somebody who will come and say I want to do this, I think that's great." Hoodies for the Homeless isn't a non-profit organization, instead Eaton wants it to be a movement where you go through your closet, find your old hoodies, and he will pass them on. "Being that we're out here, it was very nice that someone came along and just gave us something," hoodie recipient Milo said. "I appreciate it." And in just the past year, he's given our more than 2,000 of them. Some of those are hoods with scarves attached, which is another way to get warm. It can all make a big difference when the temperatures drop, which they inevitably will as winter settles over the Big Apple. For more information on Hoodies for the Homeless, visit PushMethod.com/.